I’ll tell you, both Melly and Philip were afraid of that coop. 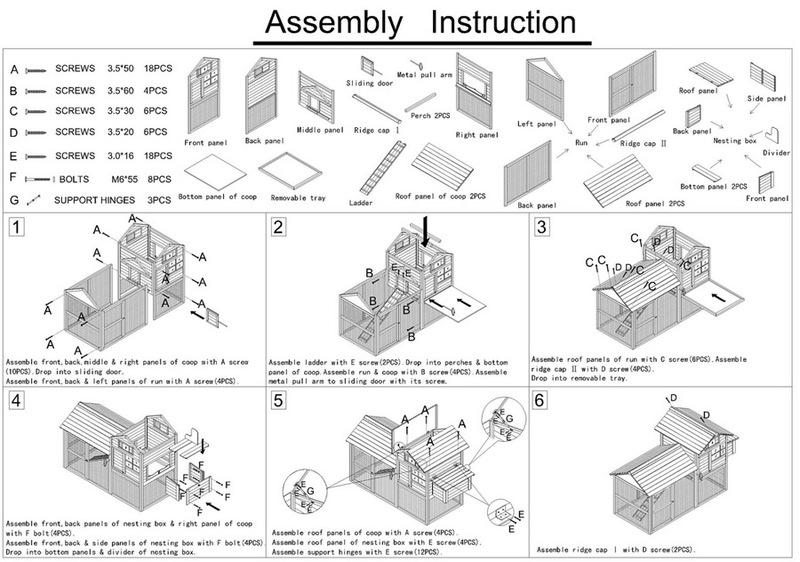 The on-line directions for putting it together looked very complicated. I haven’t noticed anything about Melly or Philip that would lead me to believe they could put something together that had so many pieces. Honestly, Melly has trouble even putting the food in my bowl without spilling it. She is an engineer, not a mechanic. Or a carpenter. Or a construction worker. Or anything very useful at all. What? It actually looks like a coop! 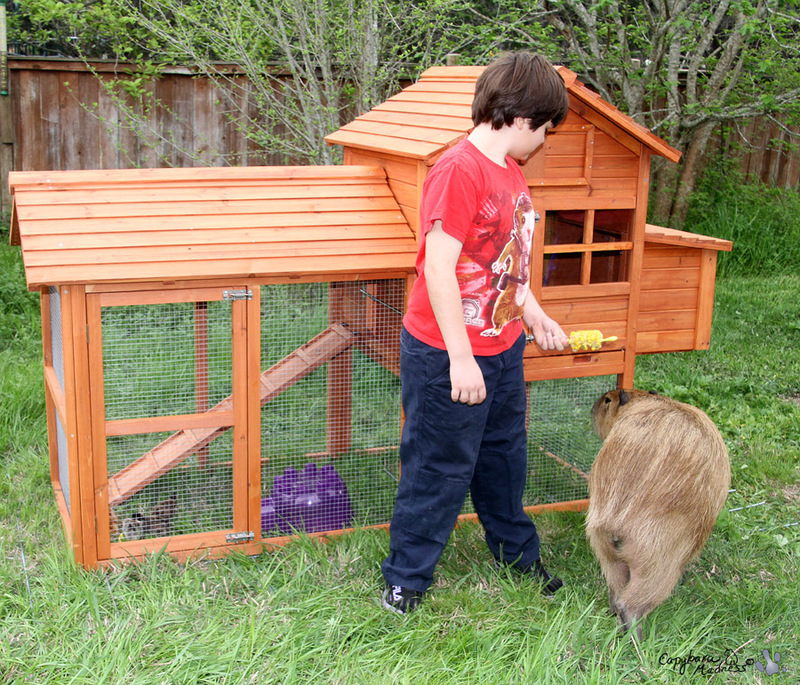 It turns out the coop was designed for people like Melly and Philip. There were little pegs to hold things together and line them up. They only had to remove one panel, flip it around and put it back in by the time they had reached this stage. Oh, and they broke the connector for the chicken ramp when they carried it out to the yard. Melly’s friend Elizabeth came over expressly to laugh at her while she tried to assemble the coop but it turned out not to be as funny as Elizabeth had hoped. And Melly forced her to help direct construction after she and Philip had to remove part of the roof in order to put some pieces inside the house part. The directions said that one person could put the coop together in 1/2 hour or two people in one hour. I think it took Melly, Philip and a small amount of Elizabeth about one hour to do it so you can see how easy it must have been. In the photo above the chickens are already in there, huddled down in the left corner. Guess what they were doing in that coop? Very first thing they were eating some of my corn! What kind of birthday present is it that eats your favorite food? In case you were wondering, the chickens’ names are, from largest to smallest or clockwise from 12:00, Thrifty, Cheap, Fire Sale and Bargain. Even little Bargain is starting to get feathers on her wings and we’ve only had her for four days! They grow up so fast. I hope that doesn’t mean they eat more corn. Technically, the coop is part of my birthday present so I had to go check it out. It seems way t0o nice for those noisy little chickens but since it is too small for me, I will let them have it. Melly says that when they get bigger they can have full run of the yard and only be cooped up at night. For now they can be in the coop during the day and in the house at night. Oh, that is Christopher with me in the above photo. He is Elizabeth’s son and an expert rabbit exerciser. Oakley got more exercise in one day than she normally does in a month! 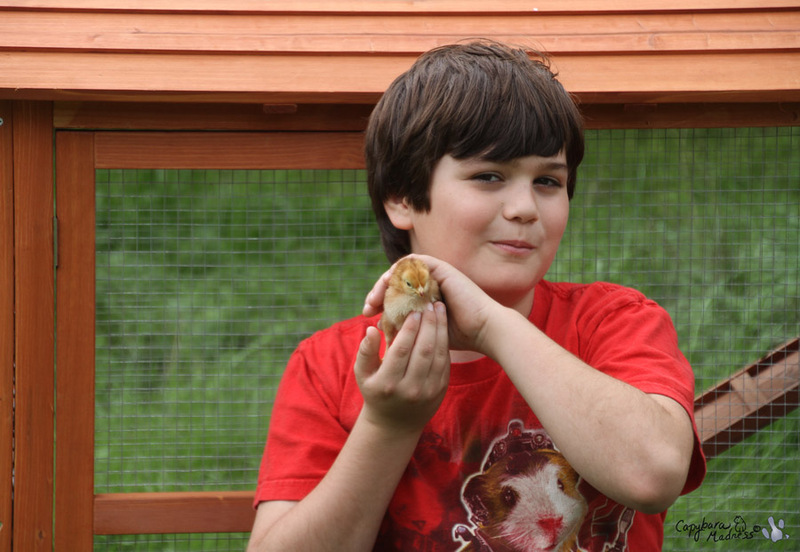 Christopher really liked my chickens and I guess I am proud of that. One funny thing is that he must have misheard Melly when she told him their names because he called Fire Sale Fire Tail! That is a cuter name and it suits her quite well. I am going to consider a name change for her, although that sort of thing can be traumatic for a chicken. 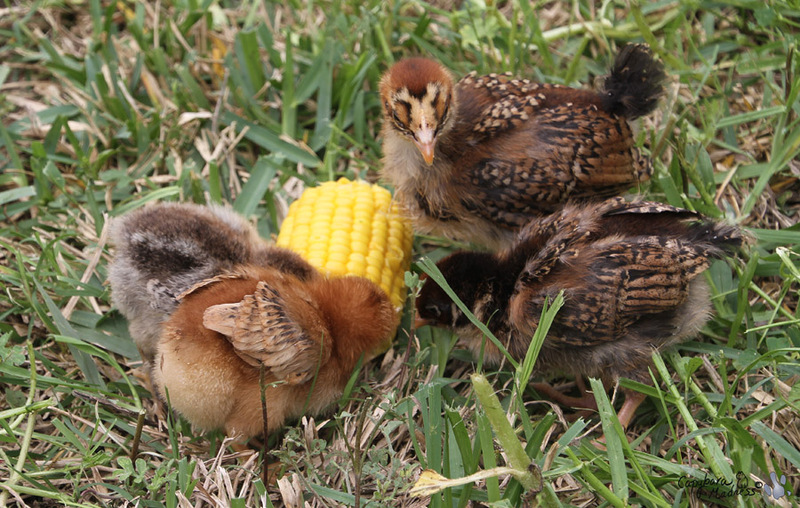 I would double check that corn consumption, Garibara….chickenettes are big eaters! Good job with coop building, human slaves! I think your humans are v clever! When I get something that needs putting together I usually take 3 x the estimated time or have to ask my brother lol! Do the chicks know how to climb the ramp yet?? It’s really a beautiful coop, till the poop takes over! Chickens look like a lot of fun to have around. Enjoy your present Gari!! 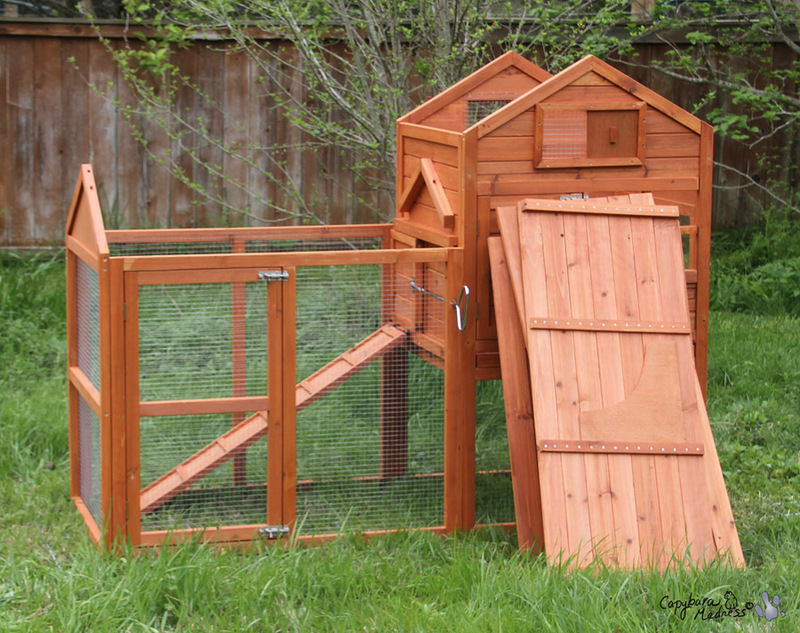 So much for a coop…looks like a condo to me..my goodness I wish I had a coop like that for myself with larger rooms. I see the sad look in your eyes Gari..poor baby. We love you. Great job, inspector Gari! 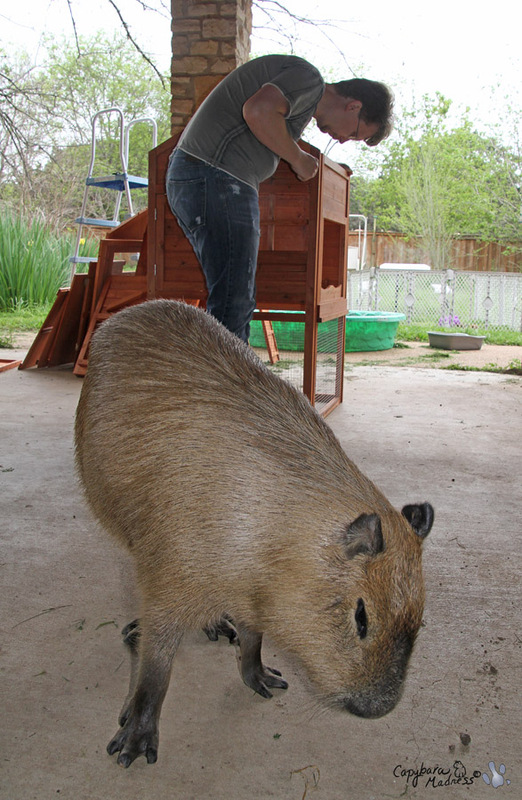 And I love Christopher’s shirt, the next best thing to a capy shirt. I like Christopher’s guinea pig shirt! 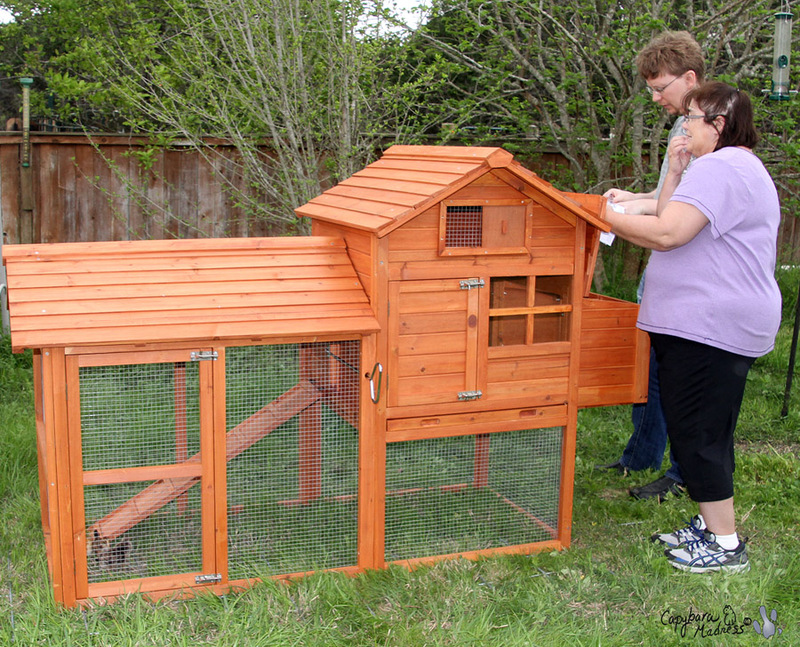 And that’s a nice little coop for those chicks, nifty how it has all those doors & windows. That way you can keep an eye on how much corn they’re munching. The directions do look complicated, so I’m impressed they got it put together so quickly. Your posts are always so entertaining, Gari! Hey! chicks are adorable my grand father has a farm of just chickens and the make him good company!